Getting your film "out there" – whether that means out to the festival circuit or to a distributor or directly to your audience – is a sales job. A crucial part of any sales job is to figure out exactly what it is you're selling and thereby determining who might want to buy it. In this exercise you will define your film and yourself in a number of different ways. While this may seem obvious at first glance, forcing yourself to formally document these things about your film can be extremely helpful in later stages of your film's life. Start with the basics: Is your film a narrative or a documentary? (It doesn't quite fit into either category? Maybe it's experimental.) Documentary filmmakers have a variety of doc-only options in the festival arena; it's kind of a consolation prize for the fact that theatrical distribution is a rarity for documentaries. Short or feature? A lot of people misuse the word "feature" when they really mean "narrative." The word feature refers to the film's length, generally over an hour. Anything else is a short. Just as there are documentary-only festivals, some festivals focus exclusively on short films. Format - Is there something about the film's format that makes it stand out? There are festivals that focus heavily/exclusively on formats. Animated films, movies shot on celluloid, hi-def video – sometimes the medium is what matters. Subject matter - this one's a biggie, and your film may qualify for any number of special-interest festivals based simply on what's in it. Go through your film carefully and really think about the people represented in it. What they do, what they like, where they go to shop and eat and have fun. All of these things affect the kinds of festivals and audiences that will be interested in your film. There are festivals for extreme sports, for individual ethnicities, and for films of particular genres. There's even a film festival for movies that feature bicycles. Find your niche and exploit it. Location, location, location. Festivals love to play movies that feature hometown talent and settings. It's best if your film features recognizable landmarks around town, of course, but sometimes you can even get credit if someone in your cast or crew happens to be from a town with a festival. Exploit the "local filmmakers made good" factor by mentioning relevant facts in your submission cover letter. Cast and crew. It's something of a truism that recognizable faces will help your film get into festivals – fests need sure-bet movies with household names to pack a few showings. (If your film isn't one of those, try not to be resentful of the movies that do have stars. Without those tent-pole flicks to guarantee ticket sales, the festivals wouldn't have the ability to program films like yours. )Look beyond the faces in your picture to the crew around you – do any of them have alum status at film festivals? Those connections can help your film too. Don't be shy about it. You're not just selling your movie. You're selling yourself, too, and there are things about you that can help spur an audience's interest in your film regardless of what appears on screen. Take a minute to think about the things that define you and how that will affect the list of festivals to which you will apply. Demographics: Gender, ethnicity, religion, sexuality. All of these things have festivals of their own. There are over a dozen festivals now that focus exclusively on the work of women filmmakers. There are few major metro areas left without a gay/lesbian/transgender film festival of their own. African-American festivals abound, sometimes under the code-word "urban." It may seem superficial at first but these are all audiences that hunger to see themselves (and the work of their fellows) on screen. Your alum status. Festivals love to nurture the careers of filmmakers they "discovered," so be sure to stay in touch with all of the programmers who discovered you. 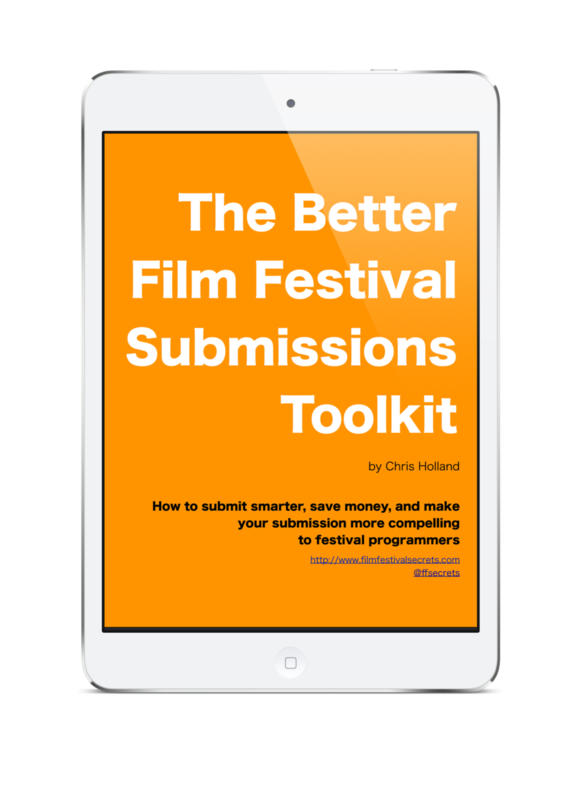 When your film is complete, shoot each on an email and offer to send over a screener. Get that dialogue going and you will likely find yourself with a waived submission fee at the very least. Your location. It may not help get your film into these festivals, but it's always a smart idea to submit to the festivals within easy driving distance. If you can't make a play for being a local filmmaker, at least you'll be able to attend the festival if you get in. Places where your friends and family live. Anywhere it will be easier/cheaper for you to stay is a good candidate for festival submissions. Where would you like to go? Submitting to festivals in towns you've always wanted to visit can increase your incentive to attend those festivals once you get in. Even if the festival experience itself proves lackluster, you will at least have the fun of sightseeing in your chosen destination. Government assistance programs for which you qualify. Some national and local governments have filmmaking grants that can help you travel to or apply for particular festivals. Get in touch with your local film commission and see which grants are available to you, and what festivals they support. Armed with this information you should be able to start your festival strategy. There's lots more to be done (you have to actually find those festivals, which means more research), but this gives you the foundation to determine whether a festival's interests match yours.